I think a grossly under-spotlighted artist is Beverly Pepper. I love her huge primary structures that are so elegant and simple. 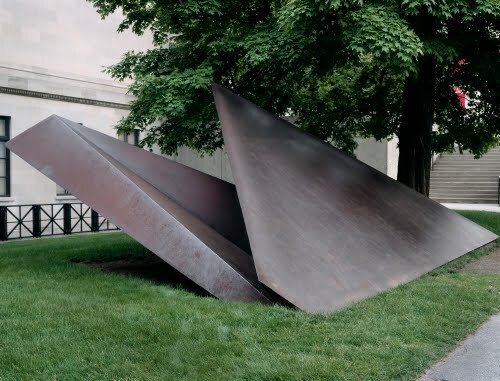 I have to say that any artist who works in such large, Cor-Ten steel constructions has always got my attention, especially the oxidation of the surfaces! Minimalist sculpture on a large scale is sometimes called Primary Structure. Primary Structures: Younger American and British Sculptures was a 1966 exhibition at the Jewish Museum in New York. The exhibition consisted of monumental single and multi-unit masses, usually based on geometric shapes. These works evolved out of the constructivist sculpture of the first two decades of the 1900s, on a larger scale. The works were constructed out of industrially-produced materials. Since the 1960s, Pepper has been a sculptor of monumental minimal sculptures. While they reflect the scale and material of "primary structures," they are infused with a personal mysticism that is avoided by Minimalist, primary structure artists. Pepper was born in Brooklyn and studied at Pratt Institute when she was 16. She originally wanted to study graphic and industrial design and photography. She also took courses at the Art Students League, but worked in advertising until 1948, when she moved to Europe. In Paris, Pepper studied painting with the Cubist realist André Lhote (1885–1962) and Machine Cubist Fernand Léger (1881–1955). Her first paintings depicted social themes. After Paris, the artists moved to Todi, Italy. A trip to Asia where Pepper saw Cambodian temple sculpture inspired her to turn to sculpture. She initially carved in wood, but she was inspired to work in steel after seeing the work of David Smith (1906–1965), who lived in a nearby Italian town. She soon thereafter became apprenticed to a master ironworker, and showed her first welded, outdoor sculptures with Smith and Calder in Spoleto in 1962.
Pepper began working exclusively with Cor-Ten steel in the 1970s. Her works often explore the themes of growth, rejuvenation, and continuity. Her works often appear to grow from the earth in which they are situated. That organic aspect to the piece is contrasted with the asymmetry and sense of floating that defies either balance or a notion of stability.